Drumstick leaves can be called the "Queen of all Greens" as it has the richest source of beta carotene among all green leafy vegetables. It is also rich in iron, calcium and vitamin C. Include drumstick leaves in your diet once in a week and protect yourself from certain degenerative diseases. Since I have a drumstick tree in my backyard, I prepare this murungai keerai poriyal once in a week. My children do not like it and never used to have it, in spite of telling them its innumerable health benefits. But now things have changed, in fact they ask for more servings. The trick is, I cooked it with a little shredded cabbage. Believe me, it tastes awesome. Do try it and you will not regret it.Today we will learn how to make delicious murungai keerai poriyal following this easy recipe. Remove the leaves from the stem, wash it and chop it. Though it is a bit time consuming job, it is worth the effort. Consider its nutritional value and spend some time for it. Chop onions finely and shred cabbage finely. Heat oil in a pan/kadai and add mustard seeds. When it splutters, add urad dal, hing and red chillies. When dal turns golden brown, add finely chopped onions, saute until they turn transparent. Then add the finely shredded cabbage and chilli powder. After cabbage is slightly cooked, add the drumstick leaves. Cook covered on low flame stirring in between till it becomes tender. Add salt needed. You can sprinkle little water in between. Once it is cooked, add grated coconut, mix well and remove from heat. Serve as an accompaniment with rice. I personally prefer it with Kuzhambu Sadam. You will love my iron and protein rich Murungai keerai adai recipe also. looks cool padhu... nice recipe..
A healthy recipe and loved the combo with cabbage,never tried. Sure to try soon as I get hold of some drumstick leaves,not so luck as you to have in backyard :):) Loved the presentation. i have done this with valaipoo , but with cabbage new to me , i will try it yes with vathalkulabu , it will be great. 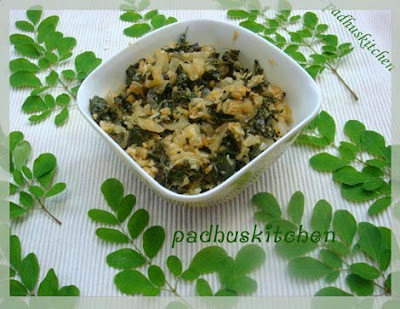 Lokks so good padhu, Very healthy side dish.. This is one of my fav stir fry..look delicious padhu. This is a new recipe for me quite interesting..very good to health. That's really yummy. Thanks for sharing. Ive never been lucky enough to find these leaves around here. I love them and yours looks perfect..am craving 4 some now .. I love muringa leaves... Especially with dal.. Should have tasted great with cabbage too.. Combination of drumstick leaves and cabbage sounds delicious in this curry. Liked the combo of this healthy preparation. Healthy n delicious curry with drumstick leaves..
Never tried,but will do now. Interestingly,we do have a tree but tenants steal the drumsticks and we have to get it from the market. Hopefully, none of my tenant is reading about the leaves here. thanks for posting such a wonderful veggie dish. For the first time i got the drumstick leaves here in Atlanta and making the subji was amazing. thank you very much. its sounds nice. today i will try padhuji. I tried this today and it turned out yummy.with the same ingredients i added some rice and nade it as a cabbage moringa rice too...since I always make cabbage rice it was easy to add the moringa leaves. vendhaya keerai sambar. Just replace vendhaya keerai with drumstick leaves. Will soon post drumstick leaves sambar recipe separately. Cool I knew only one recipe, wt dal. Tis is new n will definitely try it. Thanks. i tried without cabbage and it tastes divine. When to add the chilli powder? Add after you add cabbage. I will update it. I missed mentioning it. Thanks.